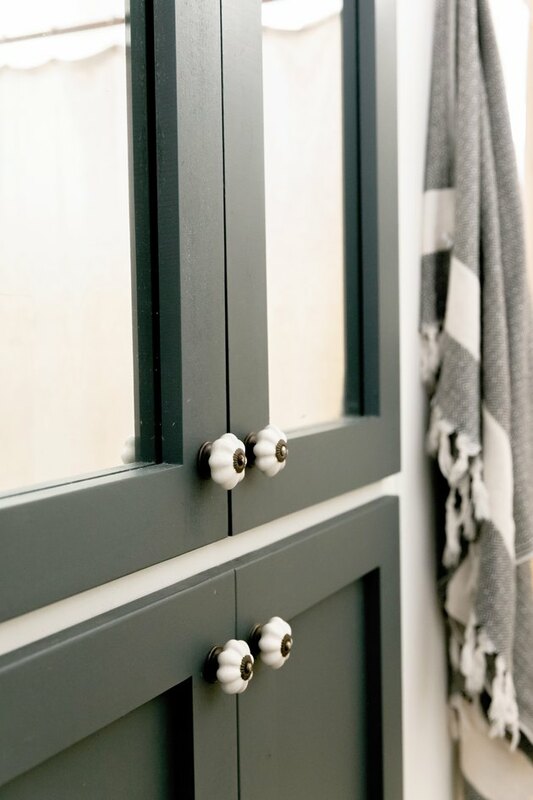 A nice coating of paint can make old cabinets look new and can even make cheap cabinets look not-so-cheap. The secrets to this transformation are proper technique and the right tools and materials (and keep in mind that once the cabinet surfaces are covered, the only thing that shows is the paint job). Follow a simple, if time-consuming, six-step process to paint your wood cabinets with fabulously smooth results. Cleaner/degreaser: Use TSP (trisodium phosphate) or a suitable alternative for cleaning the cabinets. If they are kitchen cabinets that are really grimy, you might want a stronger degreaser. Sandpaper: 120-grit and 220-grit sandpaper or sanding sponges. If the cabinets have detailed profiles or fancy edges, you can use an abrasive pad (such as a green Scotch-Brite) to scuff up the detailed areas. Also grab a dust mask if you don't have one at home. Tack cloth: For removing sanding dust from the cabinets. This sticky, gauzy cloth is sold with paint and woodworking supplies. Wood putty: For filling dents and dings, and for hiding old screw holes you won't use if you're replacing the cabinet knobs and pulls. Use either traditional hard wood putty or synthetic wood filler. Do not use spackling compound or caulk as a filler because they shrink as they dry. Primer: Primer helps the paint bond to the old surface (especially old painted or lacquered surfaces) and fills pores in wood grain better than paint. The best primer to use depends on the application. If you're going over paint, use an alkyd-resin sealer, such as INSL-X Prime Lock) for reliable adhesion and stain-blocking. If the cabinets are finished with lacquer or urethane or have a or plastic laminate veneer, prime them with an acrylic-urethane primer sealer. If the cabinets have a pronounced wood grain (oak is a good example) that you want to cover, use a high-build primer. Make sure any primer you use can be sanded for a smoother finished product. Paint: Paint for cabinets is subject to personal preference. For the smoothest, glossiest finish, the best option is still oil-based (alkyd) enamel. It takes a long time to dry and is messy to clean up, but it self-levels better than water-based paints. The next-best option for smoothness is 100-percent acrylic paint. This is a water-based formula, so it cleans up nicely and dries relatively fast. It's also comparable to oil paints in durability. Brush/roller/sprayer: Choose your weapon(s). Most amateurs paint cabinets with a brush, and for this, all you need is a very-good-quality 2-inch sash brush (straight or angled). If desired, you can use a small paint roller with a high-density foam roller sleeve on the flat parts (like cabinet door panels and box sides). Rollers create a smooth finish with no brush marks, but you still need a brush for edges, corners and profiles. You can also paint cabinets with a sprayer, such as a high-volume low-pressure (HVLP) spray gun, for the smoothest paint job possible—that is, if you're pretty handy with a sprayer. Paint props: These inexpensive plastic pyramids or tripods are optional but are very handy for painting cabinets. They allow you to flip over painted doors and drawer fronts as soon as the paint is dry to the touch, so you can start on the other side. They're sold in packs of 10 or 20. You can also make a DIY version by driving a long screw up through a square of scrap wood. Start by removing all of the cabinet doors and drawers, and removing all hinges and other hardware. Also, remove the drawer fronts from the drawer boxes (if they are screwed in place). As you remove each piece, label it with a piece of painter's tape and a number that identifies which cabinet it belongs to. On the cabinet doors, you can simply write the number inside one of the hinge mortises (recesses), since you don't need to paint in these areas. Mask off the countertop, walls, ceiling and everything else in the room that you don't want painted, using painter's tape and rosin paper or plastic sheeting. Scrub every piece that will be painted with a cleaner (such as TSP) or degreaser and water. Old cabinets are loaded with fingerprints and, in the kitchen, years of cooking oils. It's fine to use an abrasive pad for cleaning because you'll be sanding the cabinets anyway. What you don't want to do is skip the cleaning because you will be sanding. Sanding won't remove all of the oils, and it will gunk up your sandpaper. Wipe down the cabinet parts with clean cloths and water to rinse, then let them dry thoroughly. Sand the cabinet parts—again, every surface that will be painted—with 120-grit sandpaper. You don't need to remove the old finish down to bare wood—you're just deglossing and scuffing the surface so the primer can grip to it. Sanding also smoothes imperfections in the wood and exposes areas that need filling with wood fille —and that's the next step. Warning: If the cabinets are old and were likely painted before 1980, have a paint sample tested for lead before sanding the cabinets. If the paint contains lead, use a liquid deglosser instead of sanding. Fill dings, gouges, splits and holes with wood filler, following the manufacturer's directions and smoothing the putty with a putty knife. With some fillers, it's best to overfill holes slightly so they can be sanded down flat. Let the filler dry as directed, then sand all of the areas that have filler so they are smooth and flat. Meticulously remove all sanding dust from the cabinet parts, using a shop vac (if you have one) followed by a tack cloth. Any dust left on the surface could show up in the finished paint job. Apply a coat of primer to all of the cabinet parts, starting with the backsides of the doors and drawer fronts. Place the doors and drawer fronts so they are horizontal: this allows the primer to self-level as it dries for a smoother finish. If the doors are frame-and-panel (not a single wood slab), paint the panel in the center of the door first, moving the paintbrush or roller parallel with the grain of the wood (typically up and down). Next, paint the horizontal frame pieces (called rails) at the top and bottom of the frame, moving the brush from side to side and finishing with one smooth, continuous stroke that stops at the ends of the rail. Paint the vertical side frame pieces (called stiles) last, stroking up and down and finishing with one smooth stroke. Prime the cabinet boxes using the same techniques: stroke with the grain, and finish with the rails and stiles of the box frames. If you use a roller for the door panels and the flat sides of the boxes, use a brush along the edges of the frames and on the rails and stiles. Let the primer dry as directed, then prime the front sides of the doors and drawer fronts. When all surfaces are completely dry, sand the primer coat with 220-grit sandpaper. Remove the dust with a vacuum and tack cloth. Paint the cabinet parts just as with the primer coat: backsides of doors and drawer fronts first, then the front sides, then the boxes. Aim for full coverage with the first coat, but keep the coat relatively thin. Watch carefully for drips and heavy areas, and brush them out as soon as you see them. Unlike with primer, you don't need to sand after the first coat of paint. Let the first coat dry fully, as directed by the manufacturer. Apply a second coat, let it dry, then inspect all of the parts and make any necessary touch-ups. If you're not happy with the overall coverage, apply a third coat. Let the paint fully cure before reinstalling the doors and drawers. Two days of drying is recommended, but three or four days is even better. The problem is that new paint isn't really dry even though it feels dry, and if you press two painted surfaces together (such as when a door contacts a box frame), the paint can stick to itself and pull off one of the wood surfaces. So a longer wait is usually worth it.